Mitch Fifield took time out from the NBN disaster and allegations of ministerial standards breaches, to launch an outraged attack on youth broadcaster Triple J's Hottest 100 countdown move. Deputy editor Michelle Pini reports. But the backdrop to the Minister for Communications' foray into music programming was not music-related but technological, as the NBN Co's announcement of further delays in the delivery of the Coalition’s “better, faster, cheaper” NBN, became public. This, of course, did not surprise many Australians, most of whom have already given up hope of seeing any development in the NBN — apart from an increase in the national debt. Indeed, even the Prime Minister and former "inventor" of the internet, Malcolm Turnbull, has described it as a "calamitous train wreck". "And what Triple J and the ABC have done is to respond to a petition which has said it's not appropriate to have the Hottest 100 on the controversial Australia Day. There's nothing controversial about Australia Day." Senator Fifield said the ABC was making a political statement in response to pressure from "people who don't like Australia Day, who don't like the fact we celebrate the 26th of January" and said the public broadcaster should not be doing that. Senator Matt Canavan echoed Fifield's outrage and described the change of date of the Hottest 100 as "disgraceful". "I don't think Indigenous people give a rat's arse." 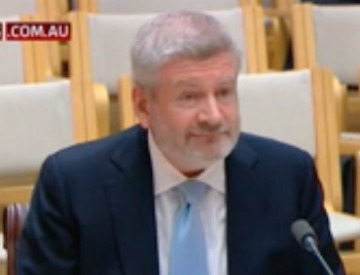 In keeping with his general state of bewilderment – over the NBN, why Parry chose to confide in him about being a dual citizen, or what possible connection there could be between his gifting $30 million to Foxtel and then accepting a gift of cufflinks in return – Senator Fifield said he was "bewildered" by yesterday's announcement from Triple J. Sometimes, as a minister, you slap your forehead and say to yourself, 'What were these guys thinking?' This is just a really bad idea; it's a dumb idea and Triple J should change their minds. For the past 20 years, the Triple J Hottest 100 has become part of the soundtrack of Australia Day. It's something that Australians enjoy. It's one of the fixed points of reference. "I already have made my view clear to the ABC ... And I'll be asking the board of the ABC, who have the ultimate programming and editorial responsibility, to reconsider this." Let's hope he didn’t register his complaint with the ABC board via the internet. Sometimes, as a voter, you just slap your forehead and say to yourself: "What are these guys thinking?" You can follow deputy editor Michelle Pini on Twitter @vmp9. Hot off the internet. Subscribe for $5.